The crash scene in one case involving an RV with Goodyear G159 tires. Goodyear Tire & Rubber Co. received failure claims over a tire that was installed on thousands of RVs and is linked to at least nine deaths, dozens of injuries, and hundreds of crashes as early as 1996, the first year it was manufactured and installed on motorhomes, according to court documents obtained exclusively by Jalopnik. The documents also show that Goodyear appears to have vastly underreported the number of failure claims it had received over the tire to federal regulators during a previous inquiry more than a decade ago, and confirm the tire is almost certainly still on the road today. In particular, the letter reveals for the first time that Goodyear received failure claims from the G159 as early as 1996—the year the tire was first installed on RVs—until as recently as September 2015, the last year for which Goodyear had disclosed data to Kurtz. The company said as recently as last June that the G159 is still on the road today, Kurtz wrote. The 29-page letter—which you can read in full below—also says that in response to a 2006 inquiry from NHTSA, Goodyear disclosed only seven injuries from G159 failures, despite having received 74 death and injury claims at the time. Goodyear also represented to NHTSA at the time that it received only 58 failure reports over the G159, the letter says, even though it was aware of 458 crown separations. It confirms previous reporting from Jalopnik, which has published stories on the G159 since an announcement earlier this year by the U.S. National Highway Traffic Safety Administration that it had opened a preliminary investigation into the tire. The probe focuses on tires manufactured by Goodyear between 1996 and 2003 that had been installed on thousands of motorhomes. The tire has been cited in at least 41 lawsuits filed against the company, which plaintiffs say wasn’t suitable for RVs, based on Goodyear’s own internal data and experts. On Wednesday, a judge in Arizona, John Hannah, unsealed the letter—along with several hundred pages of documents—in response to a request from the Center for Auto Safety, a consumer advocate group based in Washington D.C. Jalopnik obtained a copy of Kurtz’s letter, along with more than 200 pages of records, from the Maricopa County Superior Court Clerk’s Office. “Goodyear’s need to maintain the confidentiality of the information or materials produced pursuant to the protective order does not come close to outweighing the public’s need for access (through CAS) with respect to information that relates specifically to the G159 tire,” Hannah wrote. request for comment but on Wednesday the company requested that Judge Hannah stop the publication of the letter by calling Jalopnik directly, according to Kurtz and the Center for Auto Safety’s counsel. The judge held a hearing by phone with Kurtz, and attorneys representing the Center for Auto Safety and Goodyear, the Center’s counsel said. Judge Hannah, the attorneys said, held that he could not and would not make the call, saying that Jalopnik’s not a party to the litigation and therefore not bound by any protective order. It wasn’t until Kurtz obtained a court order last summer that NHTSA was finally given access to records the attorney obtained during his legal battle with Goodyear that has stretched on for more than a decade. 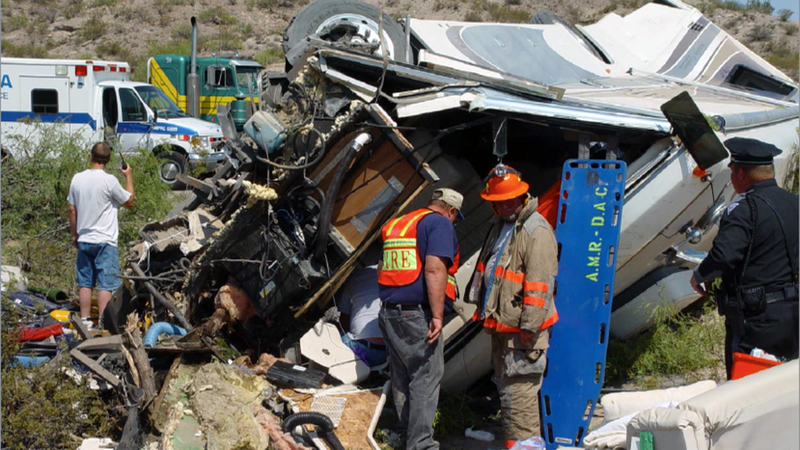 Kurtz first filed suit against Goodyear in 2005 over an incident involving the Haeger family, whose 38-foot RV had G159 tires and crashed on an Arizona highway, after the vehicle’s right front tire blew out. Kurtz’s court pleadings describe an exhaustive legal campaign from Goodyear that involved obtaining secret settlements that prohibited victims from sharing evidence with anyone—including other victims—which prevented an official finding of a safety risk with the tire from being found. In that time, Goodyear has been accused of destroying pertinent evidence that includes alleged admissions by an employee that it knew the G159 wasn’t safe for motorhomes. The Center for Auto Safety’s executive director, Jason Levine, couldn’t comment directly on Kurtz’s letter. The group’s attorneys believed Judge Hannah’s order meant the documents in the case technically still remained sealed, pending a possible appeal from Goodyear. Levine nonetheless said he was pleased by the judge’s decision. Goodyear’s official line has been that no safety defect exists when the G159 is equipped on motorhomes, despite its own records that point to a serious risk when the tire is used on RVs, and that it was initially designed for “pickup-and-delivery trucks in commercial service.” But Goodyear has argued the issues stem from user error—deflated tires, overloading the vehicle, hitting road debris. Kurtz’s letter includes an expansive section that’s effectively designed to refute Goodyear’s argument. In one passage, Kurtz cites the testimony of Goodyear’s court experts in a previous case the attorney filed against the company. Goodyear’s witness, Jim Gardner, testified that a tire like the G159, when properly pressurized and operating at 75 mph or more, would generate an internal temperature of 140-150 degrees Fahrenheit. “Once a tire exceeds a temperature at 200 degrees F, most commercial medium truck tires will begin to experience degradation of material properties that can lead to tread separation,” Gardner said. Kurtz found that Goodyear didn’t conduct high-speed tests of the G159 until “eight months after sales commenced,” the letter said. The tests concluded with worrying results, according to the letter. RVs, of course, are used at highway speeds, and Goodyear’s test found the “G159 was developing temperatures well in excess of 250 degrees when tested” for high-speed use. Goodyear’s own internal publications set forth a maximum 194 degree threshold for the tires to handle, but that was never disclosed to RV manufacturers that used the G159, Kurtz wrote. And when RV makers Fleetwood and Monaco approached Goodyear about significant failures involving the G159, Goodyear never mentioned the internal test results, according to Kurtz’s letter. The company always pointed to user error as the reason for so many failures. The argument suggests Goodyear believes the more than 700 property damage and casualty claims it received over the G159 were all due to user error. But Fleetwood or Monaco also weren’t told of the number of failure claims Goodyear had received over the G159, Kurtz wrote. As an example to rebut Goodyear’s user-error argument, Kurtz cited an incident involving Mark Salem, who owned a Fleetwood motorhome that had G159 tires. Jalopnik previously reported that Goodyear received claims as far back as 1999, but Kurtz’s letter shows the company has disclosed it received notices of G159 failures starting in 1996, the first year it was manufactured and installed on motorhomes. “Almost universally all of the failures occur at highway speeds,” he wrote. For context, Kurtz points to the failure rate of the defective Firestone tires that ensnared Ford in a nationwide scandal nearly two decades ago. Court filings suggest the G159's failure rate is anywhere from 10 to 27 times worse than the Firestone tires deemed defective by NHTSA. Goodyear employees themselves can’t identify any tire made by the company that comes close to the G159's failure rate, Kurtz wrote in the letter. “Goodyear admits it cannot identify a single Goodyear tire with death or injury claims that approach those revealed by the G159 on an equivalent production basis,” the letter stated. Kurtz’s efforts found that Goodyear has received at least 98 injury/death claims in total over the tire. Those types of claims were of interest in 2006 to NHTSA, which at the time was conducting an engineering analysis over front tire failures that occurred in motorhomes made by Country Coach with Toyo-manufactured tires. Determine the approximate “failure rates” due to tire blowout, tread separation, abrupt loss of air, and the like, for front tires manufactured and sold by Goodyear and installed on Class A motorhomes; and to determine the approximate comparative failure rate due to tire blowout, tread separation, abrupt loss of air and the like, for equivalent tires manufactured and sold by Goodyear and installed in other (non-model) motorhome vehicle applications. NHTSA, Kurtz wrote in the letter, “made clear the scope of its inquiry regarding ‘failure reports’ with an expressed definition.” That was to include “reports from all sources,” including but not limited to warranty claims, and owner, dealer or manufacturer complaints. Failure reports, NHTSA said, should include “reports of tire failures that Goodyear has determined in its normal and reasonable investigation” of warranty claims, complaints, and reports that were caused by normal wear, misuse or abuse. NHTSA’s communication, according to Kurtz, “made clear that failure to truthfully respond would subject Goodyear to civil penalties pursuant to 49 U.S.C. Section 30165.” NHTSA has said that some of the claims weren’t required to be reported under federal law, but the discrepancy between what Goodyear knew and what it disclosed is vast, according to Kurtz’s letter. Nevertheless, Goodyear only disclosed seven injuries from G159 failures to NHTSA, according to the letter. The manufacturer was aware of 453 crown separations and hundreds of property damage claims, but in total, Goodyear disclosed to NHTSA only 58 failure reports, the letter said. Kurtz’s letter is a dense one that reads like an indictment of Goodyear, capturing how long the company’s alleged scheme to prevent the public from understanding the G159's problems has gone on. For years, the attorney fought Goodyear to turn over relevant property damage and injury and death claims, as well as testing data on the tire. Over time, he has accumulated more than 400,000 pages of documents and has filed more than 1,000 court pleadings. “Handling this investigation over the last 14 years has caused tremendous personal sacrifice and financial loss for my family,” he wrote. Kurtz said in the letter that he’s pleased NHTSA is taking up the investigation. “Thus Goodyear could control the information available to each plaintiff,” Hannah wrote. It’s unclear if Goodyear plans to appeal Hannah’s order. A separate federal case filed by Kurtz remains pending. For NHTSA’s part, the agency asked Goodyear on Tuesday for more information on the G159, as well as tires that were used to replace the G159. The company must respond to NHTSA’s request by May 4.